"Lewis and Clark State Recreation Area, Oregon"
The Lewis and Clark State Recreation Area is located on the Sandy River at River Mile (RM) 3, sixteen miles east of Portland, Oregon. Use Exit 18 off of Interstate 84. 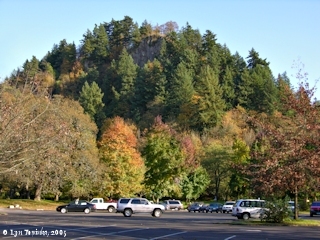 Within the Lewis and Clark State Recreation Area lies Broughton Bluff, a popular climbing area. 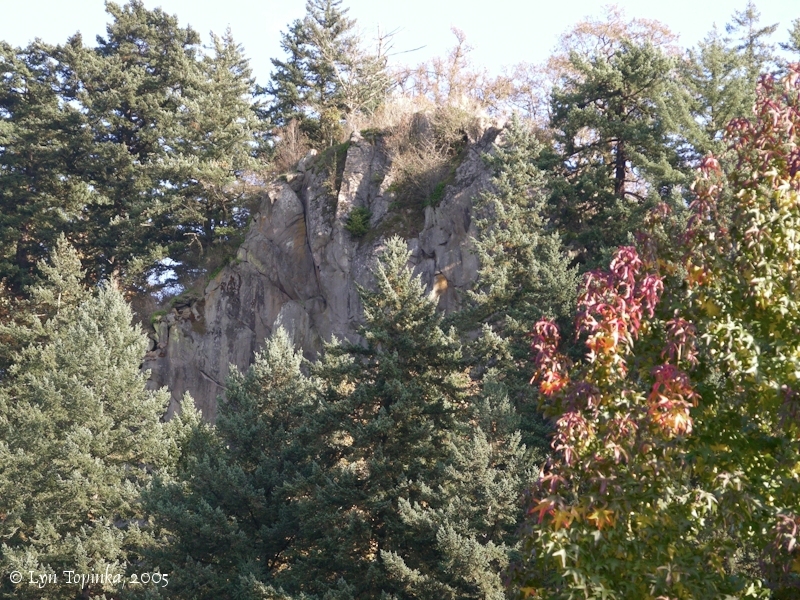 The bluff borders the right bank of the Sandy River and is part of Chamberlain Hill Volcanic Cone. Broughton Bluff was named after Lieutenant William Broughton of the British Captain George Vancouver Expedition who was the first European to travel this far up the Coumbia. 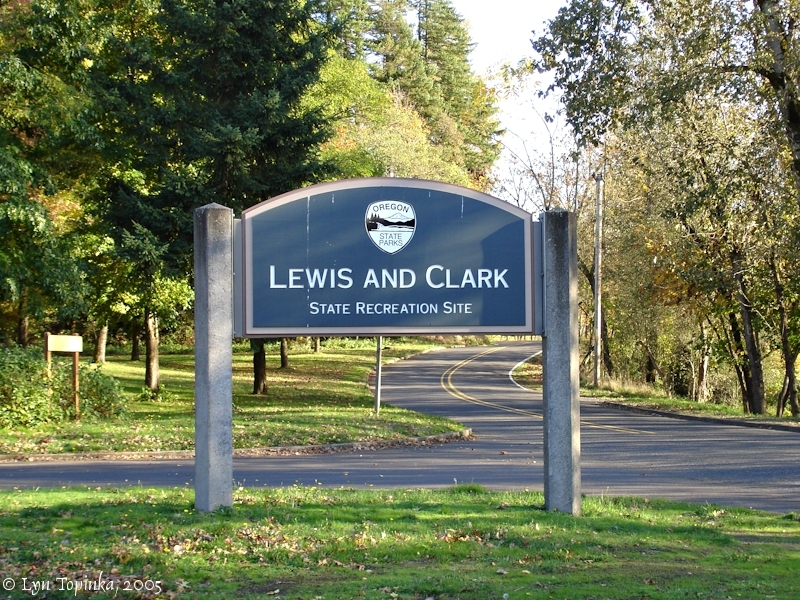 Lewis and Clark State Park is located on both sides of Sandy River at the east edge of the community of Troutdale in Multnomah County. It is bisected by the Union Pacific Railroad tracks and adjoins the right of way of Interstate Highway 80N. The first land obtained for this 56.03-acre park was a gift of one acre from Multnomah County in 1936. Another gift of 0.4 of an acre was received from S. H. and Ellen B. Martin in 1961. There were seven purchases, three of which totaling 3.94 acres were from the State Land Board and the remainder was excess right of way land acquisitions with the costs proportioned. Preservation of a popular smelt fishing site of long-time use and the interesting picnic and camping area prompted acquisition of this land. The area was named in honor of the long-used camping place at the mouth of the Sandy River where the early 19th Century Explorers, Lewis and Clark, camped on November 3, 1805, for several days while examining the Sandy River. They called the stream Quicksand River. According to Oregon Geographic Names, it appears that the name was shortened about 1850 to Sandy River. The river, however, was originally named Barings River by Lt. W. R. Broughton of Vancouver's Expedition on October 30, 1792. The area is generally open ground. Native trees grow along the river, on the steep banks above the use area and south of the railroad tracks. During the spawning season of the tiny smelt in early spring, the park is overrun with visitors. This, however, is of short duration. During the short period when the smelt leave the Columbia River and enter the Sandy on their way to spawning grounds, thousands of people flock to this area to net a fair supply of these tiny fish. Nets fastened to the end of long poles are used to dip the finny denizens from the water. Buckets, kettles and such articles are sometimes used successfully when the run of fish is heavy. 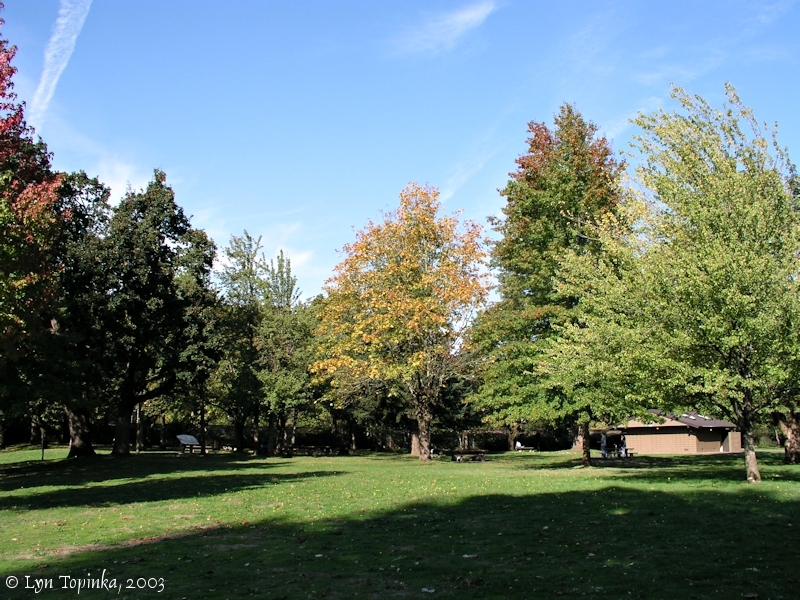 Improvements at the park include a road through the use area on the east side of Sandy River, car parking space, tables, stoves and sanitary facilities. Many trees were planted in the area and a small overnight camp to accommodate 13 tents was facilitated. Day visitors during 1963 totaled 233,454. Overnight camping was provided in 1961 and the total campers during 1963 was 5,540." Click image to enlarge Fall colors, Lewis and Clark State Recreation Area, Sandy River, Oregon. Image taken October 22, 2005. 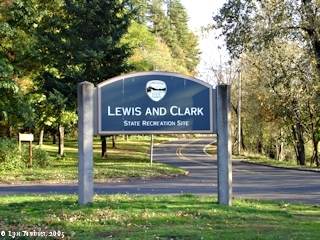 Click image to enlarge Lewis and Clark State Recreation Area, Oregon. Image taken October 18, 2003. Lewis and Clark State Recreation Area, etc. Broughton Bluff, the northwest tip of Chamberlain Hill, is a prominat feature rising above the Lewis and Clark State Recreation Area. 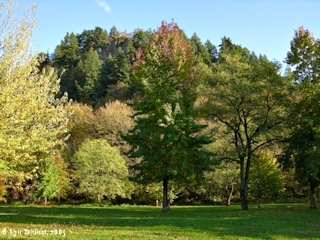 Click image to enlarge Broughton Bluff, Fall colors, Lewis and Clark State Recreation Area, Sandy River, Oregon. Image taken October 22, 2005.